It turns out that fairy tales aren’t dead and that the RBA isn’t willing to be pushed around by property market pundits crying out to “save” a market that has merely returned to warm from red-hot. We got the latter call right of no rate increases, but not even close on picking Prince of Penzance. The Aussie dollar rallied a little on the news, but in our opinion surprisingly little given the market unwound all the pricing of more cuts we discussed in the blog last week, to finish (largely) back where it started a month ago, with one and half cuts priced in. The RBA is clearly hoping that if the Federal Reserve does go in December (discussed below), they can stimulate growth with a lower AUD without having to stoke the fires of the Sydney property bubble that much more. WHAT’S SO INTERESTING ABOUT THE UK FOR MORPHIC? If we move onto our main topic for today the UK, firstly some background on the title “Carn-he or Carnt-he”. 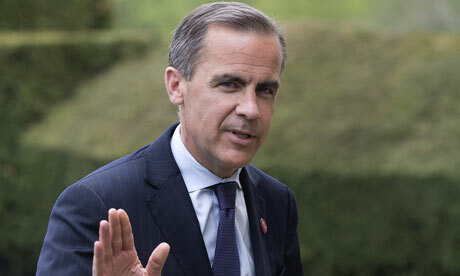 It’s a play on the name of the Governor of Bank of England, Mark Carney, who has been a described as the George Clooney of Central Bankers with his tastes in housing and a wife who is a social advocate and a very un-Central Bank pay packet. Thus far, since his arrival in 2012, its $2m a year of pay to not move rates at all, which is an exceedingly large amount of money for doing not much at all. But this is perhaps about to change, with the rates markets suggesting that the BoE is likely to make the first move somewhere between March and June 2016 (chart 2), which is basically just after the US Federal Reserve is expected to have gone, with that market pricing a move by March. This is because the UK is one of the few places in the world experiencing both accelerating forward indicators (such as the Purchasing Managers Index) and falling unemployment, both of which are shown below. In some respects the UK economy should be closer to its first rate increase as the Natural Rate of unemployment there is higher than the USA and you are seeing that in wages pressures at margin, building faster in the UK. But Carney desperately doesn’t want to be the first Central Banker to go in a hiking cycle ahead of the Federal Reserve as that could send the Pound up faster than the BoE would like and brings unwanted attention on the what for both banks will be an unusual hiking cycle after their respective Quantitative Easing programmes. But the data out this week in the UK for the October PMI, showed the rate of expansion there accelerated faster than expected (the spike up in the blue line at the right), leading to speculation that rates may have to move earlier and/or faster in the UK if this translates into faster wage growth and tightness in the labour market. It’s hard to guess what Carney says he will do on Thursday this week when the BoE releases its inflation report and the minutes of their last meeting– his communication strategy has been as warbled as the Federal Reserve of late, with him talking about the market underpricing the potential of hikes, to then the opposite. But with a least member already voting for hikes and talk a second or third may join them and the market having moved the first hike 7 months further into 2016 than when they spoke last (boxes in Chart 2), there is a distinct possibility that he again jaw-bones the market to move its hikes forward. Though one thing is for sure: he’ll look good doing it. WHILST ON RATES – ANY THOUGHTS ON THE FEDERAL RESERVE STATEMENT FROM LAST WEEK? The Fed has been saying all year that they expect to go in 2015 and with one meeting left the Fed made it as clear as possible that the next meeting is live. Last week’s Federal Reserve Statement said “In determining whether it will be appropriate to raise the target range at its next meeting,” This is the first time the Fed has made this comment and it essentially says we are serious about hiking and it could happen at the next meeting. With a strong jobs market (jobs growth is still averaging over 200k a month this year)and the impacts of Oil receding from the inflation data over the next 4 months the Fed has both mandates pretty close to target and is sat with ultra-loose policy. And there is some form for this “The Bernanke blueprint”: Yellen saw her former Boss Ben Bernanke unexpectedly pass in September 2013 to begin tapering QE to then go and make the move in December. Could this be the same playbook? At the margin then, we would now peg the odds above 50/50 of a December move, which means that Hilsenrath articles at the Wall Street Journal (the Terry McCrann of US journalism, or is it vice versa?) should reflect this in the coming month, because as we have said before, the Fed has never gone when the odds are less than 50/50 so they would want this shored up by early to mid-December. AND WHAT DOES THIS MEAN FOR INVESTORS? If we are correct on the above outlooks for the UK and the US rates markets and their respective Central Banks, then equity markets are likely to encounter a headwind into year end. We say a headwind, as historically the best gains of the year take place in the last 12 weeks of the year and October 2015 has proven to be no exception. It will also likely mean the resumption of Emerging market underperformance in December as investors are forced to bring the rate hikes back in a little closer, putting pressure back on them and further upward pressure on the US Dollar (and Pound). The timeline is to see speeches and market effects to start playing out in early December through to year end.